Welcome to the new Hotel Indigo Pittsburgh East Liberty, a beautifully restored hotel incorporating the city’s historic culture. Nestled in Pittsburgh's revitalized east neighborhood, guests can easily explore some of the city’s most popular attractions, including the Carnegie Museums, Phipps Conservatory and Botanical Gardens and Heinz Chapel. Pittsburgh is also home to several world-renowned medical centers, universities and major corporations, such as Carnegie Mellon University, the University of Pittsburgh, Google, the Software Engineering Institute and UPMC Shadyside, Presbyterian and Children’s hospitals. Each of the 135 spacious boutique rooms features complimentary Internet access, USB outlets, plush bedding and spa-inspired showers with Aveda products. Guests can also visit the 24-hour business center for any work-related needs and unwind after a busy day in our casual, yet sophisticated, restaurant and lounge. Featured amenities include complimentary wired Internet access, a 24-hour business center, and express check-in. Planning an event in Pittsburgh? This hotel has facilities measuring 2628 square feet (244 square meters), including conference space. Self parking (subject to charges) is available onsite. Where the storied three rivers meet in downtown Pittsburgh, your own story begins at Hotel Monaco. Housed in a striking 1903 building in the Central Business District across from Mellon Square Park, our boutique hotel has a playfully bold design that’s unafraid to make a statement. Across 248 guest rooms, 13 suites, and 11,300 square feet of meeting space, you’ll see curiously charming touches, like golden birdcage chandeliers, while many of our 13 suites boast separate living rooms with sleeper sofas, soaking tubs and views of the city skyline. Make yourself at home in one of the 150 air-conditioned rooms featuring refrigerators and microwaves. Wired and wireless Internet access is complimentary, and flat-screen televisions with satellite programming provide entertainment. Private bathrooms with shower/tub combinations feature complimentary toiletries and hair dryers. Conveniences include desks and complimentary newspapers, as well as phones with free local calls. 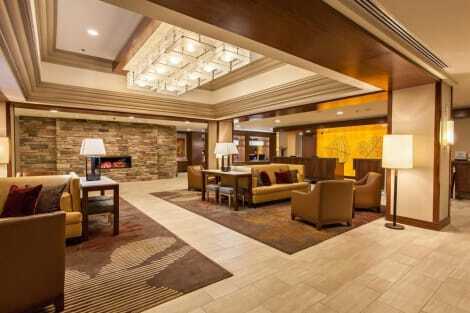 Embassy Suites by Hilton Pittsburgh-Downtown is centrally located in the historic Henry W. Oliver Building, in the heart of Pittsburgh's central business district. We are walking distance to local attractions, restaurants and shopping. Convenient for business and leisure travelers alike, our hotel is close to Pittsburgh's Cultural District, as well as PNC Park, Heinz Field and PPG Paints Arena. Visit the nearby Senator John Heinz History Museum or attend an event at the David L. Lawrence Convention Center, just a few blocks away. If you bleed 'Black and Gold', catch the Pittsburgh Pirates playing at PNC Park, or visit Heinz Field - home to the Pittsburgh Steelers. Market Square is a short walk from our hotel and offers great local flavors and handmade crafts. A short 'T' away, the renowned Carnegie Museums of Pittsburgh offer a wide selection of exhibits ranging from modern art to prehistoric objects. 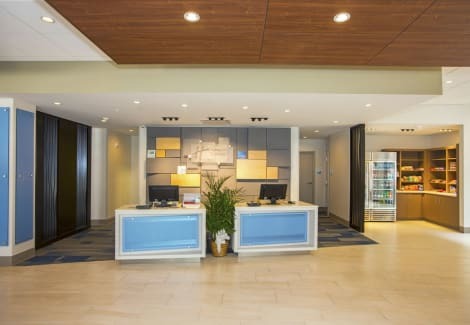 The University of Pittsburgh, Carnegie Mellon University and Duquesne University are also within easy reach.Our hotel features a 25th floor sky lobby for check-in, together with a bar and restaurant offering panoramic views of downtown Pittsburgh. Our stylish suites feature a bedroom, a separate living area, a work desk, mini-refrigerator, microwave and coffeemaker. Take advantage of our free made-to-order breakfast and don't forget to unwind at our Evening Reception* offering complimentary drinks and snacks.Plunge into the indoor heated pool, or work out at a time that suits you in our expanded, 24-hour fitness center, also located on the 25th floor. Our hotel offers a business center and an innovative meeting space for up to 150 guests in a banquet-style setting. Pre-function space, audio/visual equipment, and specialized wedding or dietary menus are also available. *Service of alcohol subject to state and local laws. Must be of legal drinking age. Featured amenities include complimentary wired Internet access, a 24-hour business center, and express check-in. Planning an event in Pittsburgh? This hotel has facilities measuring 7000 square feet (650 square meters), including conference space. Free self parking is available onsite. lastminute.com has a fantastic range of hotels in Pittsburgh, with everything from cheap hotels to luxurious five star accommodation available. We like to live up to our last minute name so remember you can book any one of our excellent Pittsburgh hotels up until midnight and stay the same night.